There has been a lot of speculation this year about whether Elizabeth Warren would run for President in 2016, presenting a progressive alternative to Hillary Clinton. This book would have been her chance to lay the foundation for such a run, if she had laid out her national vision in the book. But she did not, which says clearly that Warren actually means it when she says she is not planning to run in 2016. Hillary's book, in contrast, DOES lay out Hillary's world view; and hence is appropriately seen as pre-2016 preparation. If Warren is planning to run for president, she will need another book that is broader in its scope. This book, written in 2014, is narrow in its scope: focusing almost entirely on financial issues, in which Warren is a national leader. We do excerpt the few tidbits where Warren talks about other issues (she's for gun control, p. 237; she's for green energy, p. 333; she's for trans-gendered rights, p. 229; etc.) but those are just minor asides amidst the financial discussion. Warren is just now, after one full year in the Senate, getting her feet wet on being a national spokesperson for issues outside her area of expertise. That is a proper role for Senators, and a necessary role for presidential candidates -- but one that Warren has not taken on before, which means she's not yet ready for a presidential run. 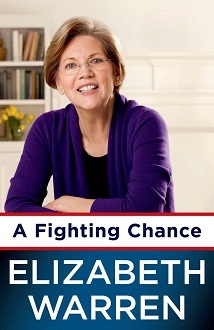 This book sure does have a lot of detail on areas where Warren IS a national spokesperson already -- especially on details of the financial crisis of 2008 and its aftermath, focusing on TARP and COP (Troubled Asset Relief Program and the Congressional Oversight Panel). Warren explains it from the progressive viewpoint -- but it's such a complex mess that one viewpoint is insufficient to fully explain it. Her viewpoint is that "Too Big to Fail" for banks is bad for the people but great for the bankers, so the bankers spent lots of taxpayer money to ensure they did well. Her viewpoint is summarized by the title of chapter 3, "Bailing Out the Wrong People". She also addresses the cause of the financial crisis: in her view, deregulation cause the whole mess (p. 177). There's also a lot about the formation of the Consumer Financial Protection Bureau, which she considers a victory of the people against the bankers. (The bankers spent $1 million a day on lobbying against it, she says on p.161, but the bankers lost). Finances would seem like a boring topic, but she keeps it interesting by putting the seriously boring stuff into extensive "Notes" -- 58 pages worth of notes for only 273 pages of text. We do excerpt some of the notes, so even those aren't THAT boring. Warren goes back prior to the 2008 financial crisis too. There's a lot about the changes to bankruptcy laws in 2005 (which she similarly describes as good for banks and bad for people, p. 34, p, 80, p. 279, p. 282, etc.) This really is her specialty: financial law, and as a watchdog on banking laws. She previously wrote another book, called "The Two-Income Trap", on family financial pressures -- we will eventually excerpt and review that book too! Elizabeth Warren: No bankruptcy for pro-life groups to avoid court levies. Scott Brown: Calls himself pro-choice, but usually votes pro-life. Barney Frank: 2007: attempted regulating banks, before financial crash. Elizabeth Warren: Bankruptcy is due to job loss or divorce, not deadbeats. Elizabeth Warren: 2005 bankruptcy law: great for companies & bad for families. Elizabeth Warren: Everyone hated "Too Big To Fail" except bankers who benefit. Elizabeth Warren: Financial crisis due to deregulation, not boom-bust cycle. Elizabeth Warren: Make bank complaint hotline public, to force self-policing. Elizabeth Warren: How we spend federal money is about choices. Elizabeth Warren: Banking lobbyists fought me on bank consumer protection. Hillary Clinton: 1998: Personally lobbied Congress against bankruptcy bill. Scott Brown: 2010: Banks should not pay $19B price for bank reform. Ted Kaufman: Succeeded Elizabeth Warren as Banking Oversight head. Elizabeth Warren: Build future for ALL our kids, including transgendered. Elizabeth Warren: Native American heritage from mother in Oklahoma territory. Charles Schumer: Bankruptcy should not avoid payment of court orders. Elizabeth Warren: Banks are larger now than when "Too Big To Fail" in 2008. Elizabeth Warren: 2010 Time cover story: The sheriff of Wall Street. Elizabeth Warren: My gaffe: Created intellectual foundation for Occupy Wall St.
Elizabeth Warren: Corporations are not people; but system is rigged for them. Elizabeth Warren: FactCheck: negotiated insurance deal for asbestos victims. Martha Coakley: Wrote op-ed advocating for bank consumer protection agency. Rush Limbaugh: Calling the rich lucky is like Mao's Cultural Revolution. Scott Brown: Dubbed one of Wall Street's Favorite Congressmen. Ted Kennedy: 1998: decisive role opposing pro-bank bankruptcy bill. Elizabeth Warren: Bank on Students Act: reduce student loan interest rates. Elizabeth Warren: Invest in our kids instead of subsidizing Big oil. Elizabeth Warren: Invest in energy technology instead of subsidizing Big Oil. Elizabeth Warren: Collective trusts for asbestos victims, not individual cases. Elizabeth Warren: Instead of voter suppression, do everything to help register. Michael Grimm: I don't believe in government. Scott Brown: Motor Voter registration "outrageous"; it helps Democrats. Tea Party: Limited role for government; not solution to every problem. Tea Party: True the Vote: like driving and seeing police following you. Elizabeth Warren: Handguns kill 8 kids a day; why don't we mobilize? Elizabeth Warren: Healthcare costs higher now than in 1970s. Elizabeth Warren: Address predatory lending targeting young military enlistees. Elizabeth Warren: Before CFPA, banks themselves chose bank regulators. Elizabeth Warren: Unions fight for their workers; not like corporate lobbyists. Elizabeth Warren: Say the word long and loud: "Union!". Martha Coakley: Supported by firefighter's union but not rank-and-file. Barney Frank: 1987: First Congressman to come out as gay. Elizabeth Warren: Fauxcahontas: Accused of using Indian heritage for gain. Elizabeth Warren: Favorite Bible verse: Matthew 25:40. New Testament: The Lord calls us to action. It's what we DO that matters. Ted Kennedy: 2009: Buried in Arlington National Cemetery with JFK and RFK. Elizabeth Warren: Who pays? Everyone, or just the little guys? Elizabeth Warren: Would you prefer air travel without any FAA? Elizabeth Warren: Nothing pro-business about crumbling roads and bridges.